Ray of Frost in action in the beta. Ray of Frost is a Secondary Wizard skill unlocked at Level 2. It fires a straight beam of cold that chills and damages a single enemy, while draining Arcane Power steadily. This skill is often compared to Disintegrate as both fire a straight beam of energy, but they are quite different in function. Both have a high resource drain while active, but Ray of Frost does not pierce, making it much less damaging against multiple enemies. It does do good damage to a single target though, and the chilling effect slows enemies, making it helpful to land more hits on an approaching foe. The skill is fun to use and very effective against single targets, with good damage and the slowing property. However the Arcane Power drain is quite high, and thus the damage per second is much lower than a number of other early-game Wizard skills. Refer to the Ray of Frost rune effects article for thorough descriptions of all five rune effects in this skill, including screenshots, videos, strategy tips, and other related information. This skill targets much like Disintegrate, but trades the piercing of that skill for a slowing cold effect. This makes Ray of Frost excellent against single targets, but much less damaging on the whole, especially against large groups of enemies. A video of Ray of Frost and all of its rune effects can be seen below, courtesy of the DiabloInc You Tube channel. 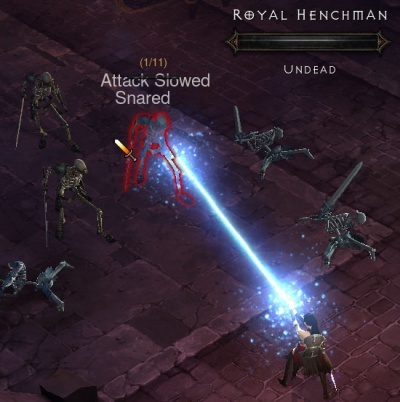 Ray of Frost was first seen at BlizzCon 2008, but only in the gameplay movie; the Wizard used it against the trap laid out by the Skeleton King. It was available in the gameplay demo at BlizzCon 2009, but was unfortunately too high level to try out by the fans. Skill tiers were removed for the July 2011 Press Event, allowing skills to unlock steadily from levels 1 to 30. Consequently, all skill levels were adjusted and Ray of Frost became a level 21 skill. Ray of Frost remained at level 21 when the beta started. With the Patch 13 changes, it was classified as a Secondary skill and dropped all the way down to level 5, giving players their first opportunity to try it out. For March's Beta Patch 14, it was dropped even further to level 2, but its damage output was increased slightly. See the Wizard skill archive for more details on previous versions of Ray of Frost and other Wizard skills. Ray of Frost used in the middle of the Skeleton King trap. Casting the spell before the hordes of skeletons arrive. Ray of Frost with all five rune effects. Players finally getting to use it with Beta Patch 13. This page was last edited on 8 June 2012, at 07:17.